A story is always more memorable if it is relatable. When the story highlights one particular aspect in our lives, it has a greater chance of becoming a personal favourite. Today I will share about a story that I believe many would find relatable. Entitled Extraordinary Jenny Jones, the story takes two forms: a book on the iBookstore and an iPad app on the App Store. The story starts by explaining how ordinary Jenny Jones is. Starting from her given name, her family name, her house, suburb, city, and even her country. Everything seems so ordinary, and Jenny feels like a very ordinary girl — just like millions of others. But there’s something extraordinary about Jenny; what everyone else sees as round, Jenny sees as square. The same is true for the other way round. Throughout the story, you will see many examples of Jenny’s unique perspective: square moon, square oranges, square fish bowls, and square bicycle wheels. You also get to see a round tennis court and a round iPod. Fortunately, Jenny has a loving family who understands how extraordinary she is. Her parents love to take her to the parade and to the fun fair. This makes Jenny feel like any other ordinary girl whose family loves her so much, despite her different perspective of the world. If you have both the book and the app, I suggest reading the book first, as it contains additional sections to help readers take full advantage of the book. What does the word ‘ordinary’ mean to you? Does Jenny think of herself as extraordinary? Is this surprising to you? Explain. Jenny is not alone in seeing the world differently. Did you know many people can’t see certain colors, and are called color-blind? What do you want kids to learn from this story? To believe in themselves. Their way of looking at the world is as valid as anyone else’s and is usually more interesting and original than adults. They just don’t realise it yet. Once you finish reading the book, you can expand the experience by playing with the iPad app. The app brings animation, interactivity, and mini games to enhance the reading experience. I really like the storyline. I find it relatable because I often feel like I have a very different perspective of many things in life. Knowing that the story was designed for juniors ages six and up, I can use it to help my juniors realize that it is okay to see things differently from their peers. I like the beautiful illustrations featured throughout the book and the app. I also like the hidden object puzzles that are available in the iPad app as they offer a unique gameplay that really suits the storyline. You either need to find round objects and tap them to transform them into square ones, or vice versa. You can find all the puzzles collected in the Magic Puzzle Teleporter. Some puzzles can be a bit difficult for young juniors as they need to scroll the puzzle horizontally in order to see the entire picture. If you’re stuck, you can always find Chairman Miao, a white cat whom Jenny considered her best friend. Tapping on her will cause a little spark on the screen, hinting you at where you might find the object you’re looking for. 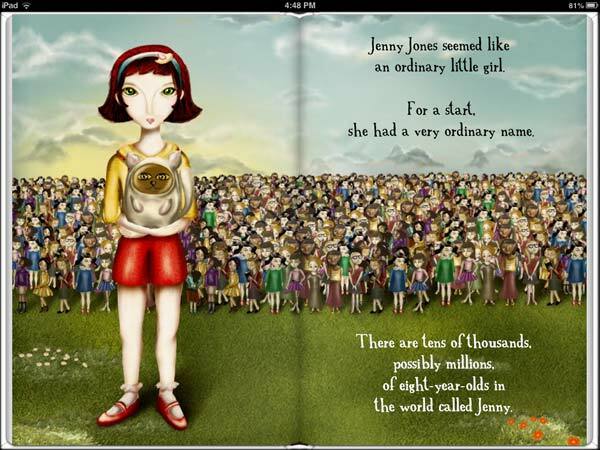 The Extraordinary Jenny Jones is a storybook with a beautiful storyline and illustration. It helps parents to explore their juniors' emotions and find how they might see the world differently. Identifying this early would help them to believe in themselves and keep their self-esteem healthy. Broadway Barks. A charming tale of a stray dog who finds a new home. Zoe’s Green Planet. A quirky, colorful story about accepting differences. The Artifacts. A dark, philosophical tale about a boy who collects everything.